Attention all Toronto Maple Leafs fans, especially those old enough to remember the last time the Leafs won the Stanley Cup. You will want to keep your eyes out for this 2010 release. Toronto Maple Leafs: Diary of a Dynasty, 1957--1967 remembers the Leafs glory days. It is put together by no fewer than four leading experts. 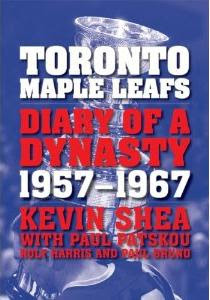 Kevin Shea is no stranger to Leafs fans as he's penned more than a few best selling books over the years. Paul Patskou is, in my estimation, one of the top five hockey historians out there today. He has the largest collection of hockey on video in the world, and enabled the authors to re-watch all of the Stanley Cup games. Roly Harris and Paul Bruno, known as "The Statsman," also contribute. When I first heard of this project, I admit I was skeptical. Another book about the Leafs glory years from forever ago? But I was pleasantly surprised in this book's uniqueness. The book is thoroughly researched, almost overwhelmingly so. The authors and researchers reconstruct the Leafs dynasty years from 1957 through 1967 with the same exhaustive attention to detail and the obvious passion as an archaeologist unearthing a great find. The book begins with 1957 to show the rise of the great Leafs teams. Of course that team, led by the likes of future Hall of Famers like Johnny Bower, George Armstrong, Tim Horton, Red Kelly, Frank Mahovlich, Terry Sawchuk and Dave Keon, would win three consecutive Stanley Cup championships from 1962 through 1964. And they famously captured another surprise championship - against their arch rivals from Montreal - in the dominion year of 1967. All of the important games are relived in this book. They are vividly reconstructed through the use of authentic calls from the Hockey Night In Canada broadcast booth, Hot Stove Lounge conversations and from interviews from the players themselves. It is these first hand accounts - many of them long lost and never-before released - make this book so special. In addition to the critical games and the Stanley Cup glory, the book also covers the team's management and ownership struggle that led to the dark rise of Harold Ballard, the creation of the NHLPA and NHL expansion into the modern era. Leafs fans, and hockey fans of that era, will definitely appreciate this book. It is an encyclopedic history of hockey from 1957 through 1967, but Shea writes it with a passion - almost an innocence - of a fan experiencing it for the first time. It is a tremendous celebration of the team and, most importantly, a tribute to the Leafs' eternal heroes. Toronto Maple Leafs: Diary of a Dynasty, 1957-1967 chronicles those wonderful seasons when the Toronto Maple Leafs skyrocketed from last place in the NHL to become the powerhouse team of the decade. During the 1950s and 60s the Leafs were always a contender and won the Stanley Cup in three consecutive years (1962-1964), along with an improbable Stanley Cup victory over their archrival, the Montreal Canadiens, in 1967 to close out the era of the original six NHL teams. Of the many books written on the Leafs, this one is unique: Kevin Shea and his writing partners revisit all the important games and moments from each season with astonishing detail based on the broadcasts of Hockey Night in Canada from that decade. There are authentic calls from the broadcast booth, Hot Stove Lounge conversations and detailed descriptions of game-changing goals and late-game heroics that have been obscured by the passage of time -- and the performance of the weaker teams that have followed. Along with unearthed, never-before released interviews from dynasty players, such as Johnny Bower, Dave Keon and George Armstrong to name only a few, the authors reconstruct Toronto's dynasty years with professional accuracy, authenticity and care. This big book will be dear to the heart of every Maple Leaf fan -- a nostalgic journey through hockey history and thus into the history of modern Canada itself. Paul Patskou is a hockey historian, researcher, writer and authority on archival hockey footage. He was the historical consultant for Leafs TV and the associate producer of Leafs Classics. Roly Harris is a life-long Leafs' fan who closely followed the team's glory years. He has spent the past 36 years working in law, as a criminal lawyer, crown attorney and judge. Paul Bruno is known as "The Statsman," primarily due to his podcasts and his work in sports statistics. He has worked with Fanball Sports Network and Stats LLC.